Yesterday started off with low clouds and poor visibility. Bill headed to the airfield anyway and on his first flight lost his plane in the fog. He thought it was gone forever after he cut the power and let it crash-land; but, with the help of his friends, they found it in the mud. After some minor on-site repairs, he was up and flying again! When Bill came home we headed to one of our favorite beaches at Lovers Key. It was low tide so I collected shells while he took pictures. There were lots of birds on the beach. 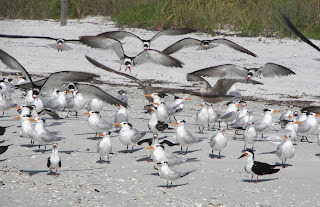 The darker ones are Black Skimmers. If you look closely, you can see that their lower bill is longer than their upper bill so they can skim the water looking for small fish. 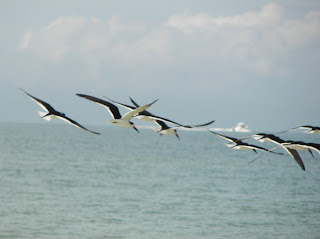 This is a great shot of the Black Skimmers flying in for a landing. 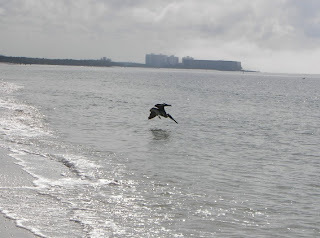 Bill took several shots of this Brown Pelican diving for fish. 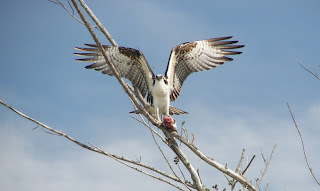 This beautiful Osprey was sitting in a tree eating a fish. He did not want to share and took his dinner and flew off. 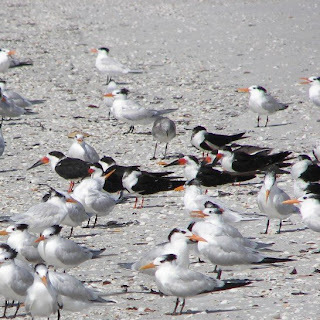 The Black Skimmers flew off when a group of people walked up the beach. 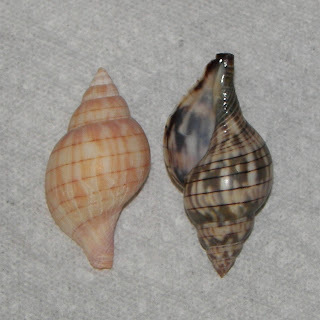 Shelling was very good yesterday. These are Banded Tulips - one of my favorites. As you can see, they come in a variety of colors. These are about 3 inches long. Tomorrow, Pamela and family arrive. Bill is working on menus and I really should be getting ready instead of working on my blog! Unfortunately, a cold front is coming in today and the weather may be the coolest we have had since our arrival. 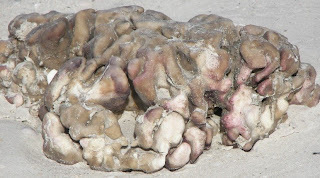 Bill found this ugly mass of Sea Pork and told me to post it and say it is the brain of a shell collector. I don't think Bill fully appreciates my collecting tendencies!